These have been transplanted in waiting beds or in plastic bags and are well established with a good root system and foliage. These plants are the best choice for local sales and are ready to plant out in the field. These seedlings have been transplanted in waiting beds at the nursery until they reach 1/2"- 1" in diameter at the root collar. Then we cut the top of the plant back to about 1" and the taproot is cut back to about 7" in length. The remaining material is known as a stump and is the easiest to transport and ready to plant out in the field. They have a greater success rate with fewer setbacks for faster continued growth. 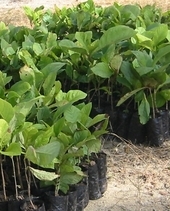 Teak plants are quite tough and respond well to this treatment with vigorous regrowth. The big advantage with stumps is less transportation cost. All prices are in Belize dollars.